Authadox: Responsive Portfolio Ghost Theme is a beautiful, elegant and responsive Ghost theme that turns your pictures in to an entire portfolio showcase. This theme accompanies people whom wish to put their digital art out on the front-end. You can strictly upload your work, or simply write a blog post—without a single image. Elegant, simple yet creative layout. Built specifically for showcasing digital art. 100% Responsive, including images & video. Ghost 0.4 ready, including static pages. Custom error page with diversion. 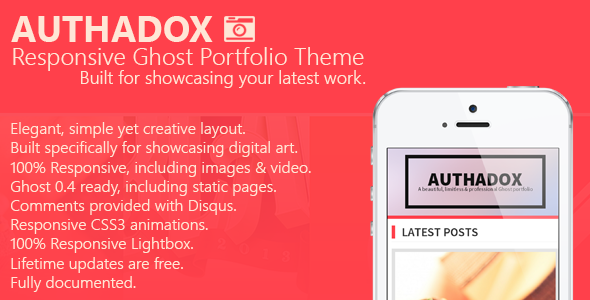 Item Reviewed: Authadox: Responsive Portfolio Ghost Theme 9 out of 10 based on 10 ratings. 9 user reviews.